Spain's sports minister has expressed his outrage after the wrong Spanish national anthem was played before the start of the Davis Cup final. Juan Antonio Gomez-Angulo, who was in the stands, waved furiously and yelled as a pre-civil war republican anthem was played for the Spanish team. The Spanish government later protested to Canberra and the International Olympic Committee (IOC). "It was an appalling mistake," said government spokesman Eduardo Zaplana. Gomez-Angulo added: "It was an offence to the Spanish nation." 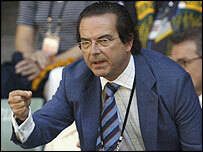 And he insisted he was not satisfied with a formal apology issued by hosts Tennis Australia over the blunder. "We cannot trivialise the national anthem of any nation and of course I will take my complaint further. The protest will go further than it did at the tennis arena," he said. "Apologies have been accepted in the first instance so as not to affect the process of the competition. "I reiterate that we are demanding a formal apology through the Spanish embassy in Australia and an explanation from the Australian government, so that at a sports level the root of the problem can be corrected for this offence done to the Spanish nation." There was booing amongst Spanish supporters in the crowd as soon as the anti-Franco anthem began. Australian captain John Fitzgerald apologised to the crowd through a courtside microphone after learning of the mistake. The correct Spanish anthem was then played as Ferrero and Hewitt walked out on court for the opening rubber. Tennis Australia immediately issued an apology, which read: "It is unfortunate the outstanding opening ceremony was marred by this regrettable occurrence. "As a mark of respect, Tennis Australia will be playing the Spanish and Australian anthems before play tomorrow (Saturday) and again on Sunday."